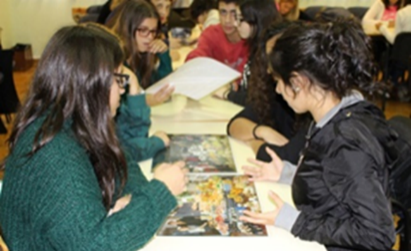 To foster this dynamic, we have the transversal projects of the AECO: UNESCO, PES, European Club, School Sports, Nacional Plan of Cinema (PNC) and Mondego EcoMuseu that frame the Climate Echo 2016-2018 and develop different themes during the school year along the curricular areas, pursuing a logic of cooperation and articulation of synergies reinforced through partnerships with the close and extended community. 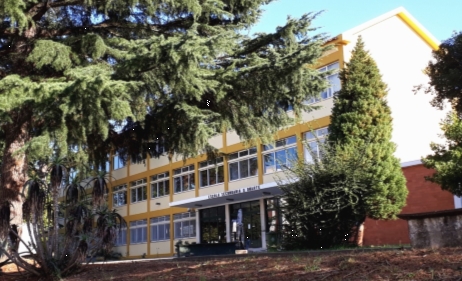 The Association of Schools Coimbra Oeste (AECO) is located on the left bank of the Mondego river, inserted in an urban and suburban environment, with good accessibility, in a space with high patrimonial value, endowed with great scenic beauty and in great development. It is a public education institution, covering pre-school education, basic education (1st, 2nd and 3rd cycles) and secondary education (humanistic scientific courses and professional courses) for a universe of 2323 students, spread over 17 educational institutions with Duarte Secondary School as Head School – being part of the UNESCO Associated Schools Network since 1989. The group presents a diversified educational offer, a good and effective follow-up work to all its students with reflexes in the prevention of the school dropout, in the creation of new opportunities of education, continuation of studies and integration in the labor market. In spite of being a relatively new grouping, it has been able to build its own identity in the construction of values and knowledge, of great dynamics, plural and humanistic, attentive to the students and to the surrounding reality, based on the pillars of education – Learning to know , learning to do, learning to be and learning to live together. It advocates a quality education for all through the development of projects in the frame of Peace, Human Rights, Intercultures and Sustainable Development contributing to the ODS of the 2030 agenda. 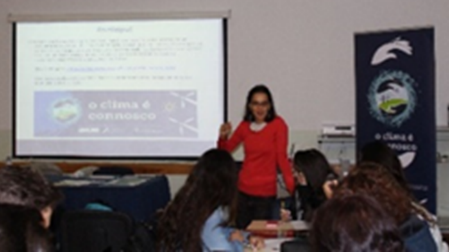 To foster this dynamic, we have the transversal projects of the AECO: UNESCO, PES, European Club, School Sports, PNC and Mondego EcoMuseu that frame the Climate Echo 2016-2018 and develop different themes during the school year along the curricular areas, pursuing a logic of cooperation and articulation of synergies reinforced through partnerships with the close and extended community. O Agrupamento de Escolas Coimbra Oeste (AECO) localiza-se na margem esquerda do rio Mondego, inserido em meio urbano e suburbano, com boas acessibilidades, num espaço com alto valor patrimonial, dotado de grande beleza paisagística e em grande desenvolvimento. 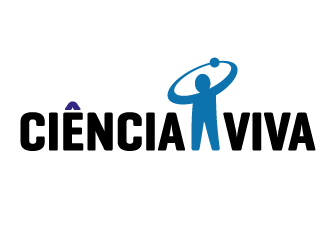 É uma instituição de ensino público, abrangendo a educação pré-escolar, o ensino básico (1º, 2.º e 3.º ciclos) e ensino secundário (cursos científico humanísticos e cursos profissionais) para um universo de 2323 alunos, distribuídos por 17 estabelecimentos de ensino, tendo como escola sede a Escola Secundária D. Duarte – pertencente à Rede das Escolas Associadas da UNESCO desde 1989. O agrupamento apresenta uma oferta educativa diversificada, um bom e eficaz acompanhamento a todos os seus alunos com reflexos na prevenção do abandono escolar, na criação de novas oportunidades de educação, prosseguimento de estudos e integração no mercado laboral. Apesar de ser um agrupamento relativamente novo, tem vindo a conseguir construir uma identidade própria ao nível da construção de valores e saberes, de grande dinâmica, plural e humanista, atento aos alunos e à realidade envolvente, assente nos pilares da educação – Aprender a conhecer, aprender a fazer, aprender a ser e aprender a viver juntos. Preconiza uma educação de qualidade para todos através do desenvolvimento de projetos no âmbito da Paz, Direitos Humanos, Interculturalidade e do Desenvolvimento Sustentável contribuindo para os ODS da agenda 2030. 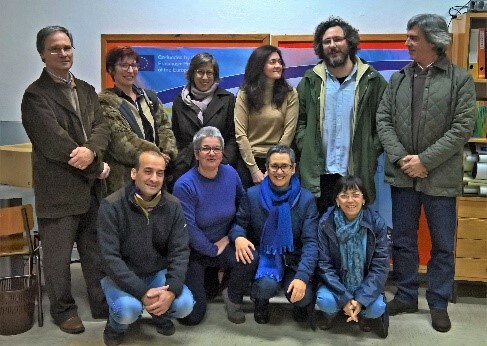 Para potenciar esta dinâmica os projetos transversais do AECO: UNESCO, PES (Palmilhar em Segurança), Clube Europeu, Desporto Escolar, PNC (Plano Nacional de Cinema) e EcoMuseu do Mondego que enquadra o Ecos do Clima 2016-2018 desenvolvem as diferentes temáticas ao longo do ano letivo junto das áreas curriculares, perseguindo uma lógica de cooperação e articulação de sinergias reforçada através das parcerias com a comunidade próxima e alargada. 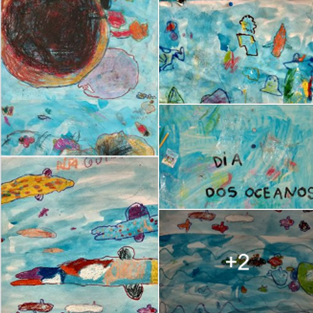 In order to commemorate this day the kindergarten students of Almas de Freire, under the guidance of educator Ofélia Libório, watched films, talked about the oceans and made some drawings related to the topic. Students from the Sociocultural Animator course participated in the short film competition with the topic “Ocean and climate changes”, created by ASPEA. 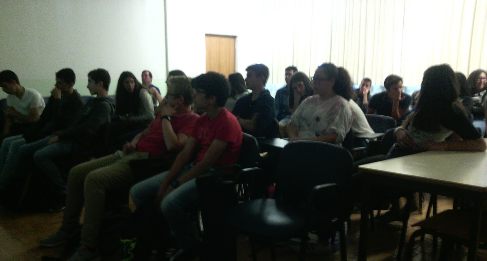 The students, coordinated by the teacher José Moura Relvas, presented 3 short films, entitled “Coastal Erosion”, “Pollution in the world” and “Everything is alrightt”. 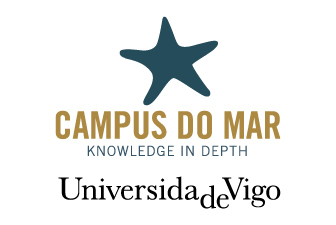 On the 2nd and 3rd May 2018 in Aveiro two teachers of D Duarte Secondary School participated in the Teachers Training Course, under the Project “EduCO2cean –STS Education models to transmit to society the challenge of global change in the ocean”. 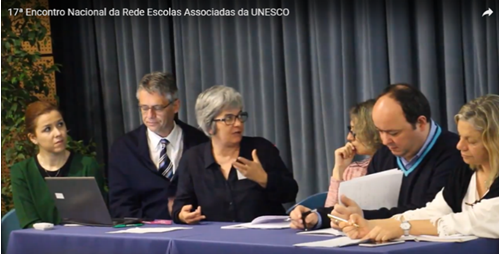 The 17th Meeting of the National Network of UNESCO Associated Schools – “The Agenda 2030 and the UNESCO Associated Schools in Portugal” took place at the Colégio Luso Internacional in Oporto on the 21st and 22nd of April 2018, for Global Citizenship, Ocean Literacy and Climate Changes. 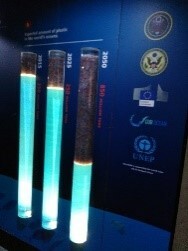 It was an excellent opportunity to share best practices and to introduce EduCO2cean. 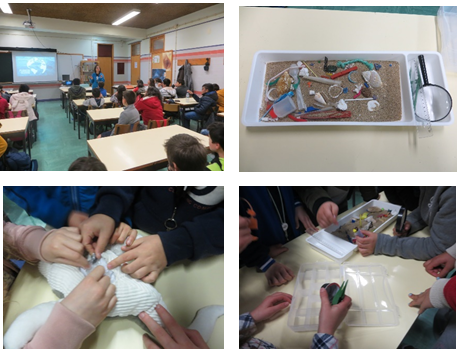 On 19th and 20th of February 2018, the the School Library of the Taveiro EB 2,3 in coordination with the science teachers and the Oceanarium, welcomed biologist Isabel Nabais, who came to perform several practical sessions on “Marine Plasticology”, with all the classes of the 2nd cycle of studies. 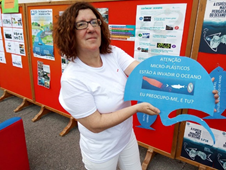 Through videos, practical experiences and sharing of opinions, Isabel Nabais was able to make the students aware of the need to change their attitude towards the use of uncontrolled plastics and their negative impact on the planet and on the Man. 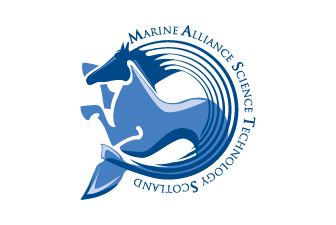 For this reason, it is important that our students also sensitize their colleagues, parents and family members about the problem of plastic in the oceans, since they now have some tools that they should spread, alerting mainly to the urgency of behavior changing. 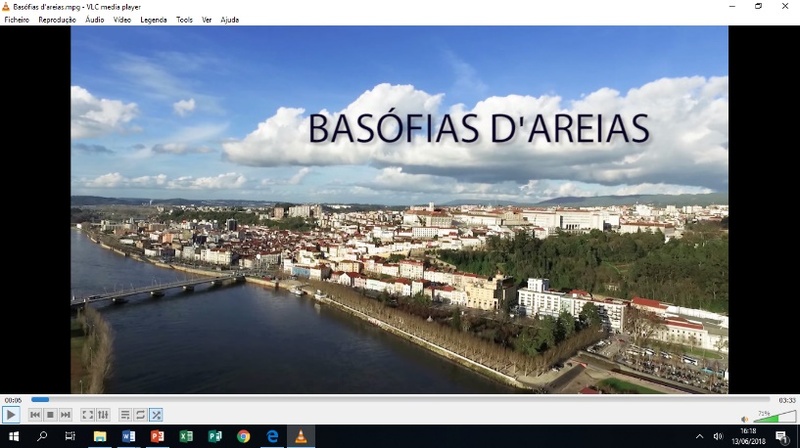 Related to the teacher training courses, and within the scope of the EduCO2cean project, some teachers from D.Duarte Secondary School created a short film entitled “Basófias D’areias”, which was selected for the World Water Forum. Students of the 1st Year of the Professional Courses of Sociocultural Animator and Forest and Environmental Resources, under the guidance of teachers Alexandra Amaral, Júlia Teixeira and Teresa Lopes participated in the International CLMNTK18 Virtual Congress. 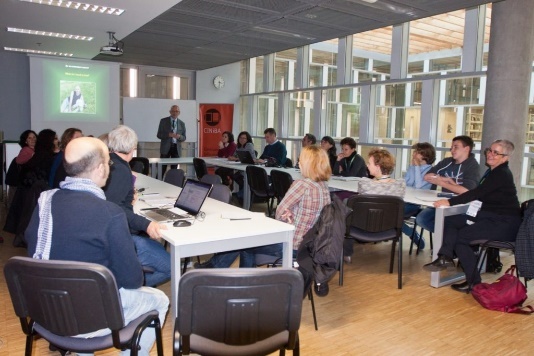 Participation of a teacher o D. Duarte Secondary School in the teachers training course, which happened in Poland, on November 2017. On November 16, the National Day of the Sea was celebrated in Coimbra. On this special day, the EduC02cean project was presented and articulated around the goal of generating a Science-Technology-Society (CTS) pedagogical model that fosters communication between science and society through educational projects using artistic techniques, on the causes and effects of climate change on seas and oceans. 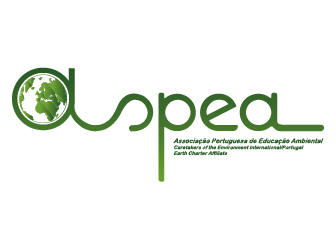 The joint organization of ASPEA – the Portuguese Association of Environmental Education and the AECO – Coimbra Oeste School Grouping through its transversal projects EcoMuseu do Mondego, PES and UNESCO, counted on the precious collaboration and work of the Professional Courses of Forest and Environmental Resources, Sociocultural Entertainer, Kitchen-Pastry and Restaurant-Bar, School Sports – Canoeing and Theater Group – ‘Trupe Leal Conselheiro’. 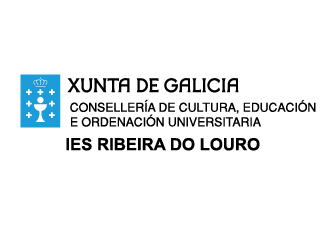 The meeting, chaired by the Secretary of State for Science, Technology and Higher Education, Maria Fernanda Rollo, was attended by representatives of various entities, namely the ERASMUS + National Agency, the UNESCO Chair of the University of Coimbra, National Commission of UNESCO, Portuguese Environment Agency, Ciência Viva, IES Ribeira do Louro, Porriño, Vigo University. 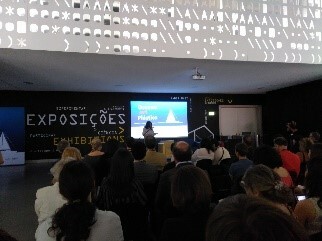 Two communications followed by a discussion with the public were presented: Microplastics in the Oceans: Challenges and Solutions by UC / MARE researcher Filipa Bessa and Biochemical response of aquatic species to climate change by UC / MARE researcher Ana Marta Gonçalves. Artistic performances Artistic performances by students from partner schools were presented by the D.Duarte Secondary School of Coimbra, Coimbra Artistic and Professional Technical Institute, Ermesinde Basic School 2,3, Dr. João Carlos Celestino Gomes Secondary School in Ílhavo, Alves Martins Secondary School in Viseu and the Spanish Institute Giner de los Rios in Lisbon. 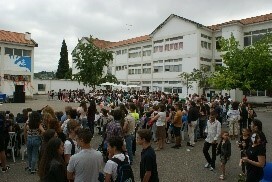 The event ended with a “Happening” at 8 de Maio Square in Coimbra. 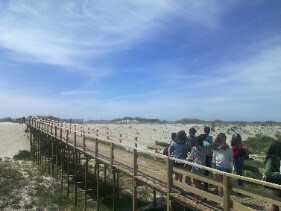 Happening the National Day of the Sea in Portugal. 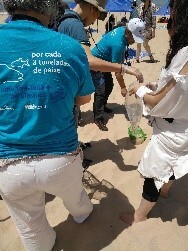 It was an intense day of sharing, in which we wanted to focus on the fact that the oceans are being severely affected by pollution and climate change, where each gesture and each one of us has much to do with the preservation of the common good, in this great condominium that is the Earth and the life in the Sea. We are especially grateful for the support of the Classical Orchestra of the Center and Fila K Cineclube, to all the speakers for their invaluable contributions, and lastly to all the students and teachers who have become so involved. A 16 de novembro, o Dia Nacional do Mar foi comemorado em Coimbra. Neste dia especial foi apresentado o projeto EduC02cean que se articula em torno do objetivo de gerar um modelo pedagógico Ciência-Tecnologia-Sociedade (CTS), que potencie a comunicação de ciência com a sociedade, a partir de projetos educativos com recurso a técnicas artísticas, sobre as causas e efeitos das alterações climáticas nos mares e oceanos. 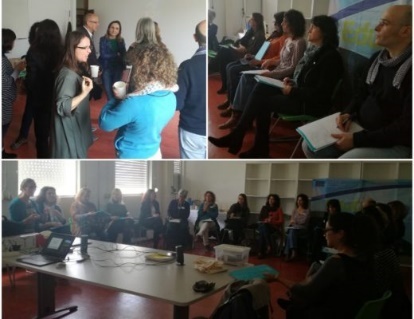 A organização conjunta da ASPEA – Associação Portuguesa de Educação Ambiental e do AECO – Agrupamento de Escolas Coimbra Oeste através dos seus projetos transversais EcoMuseu do Mondego, PES e UNESCO, contou com a preciosa colaboração e trabalho dos Cursos Profissionais de Recursos Florestais e Ambientais, Animador Sociocultural, Cozinha-Pastelaria e Restaurante-Bar, Desporto Escolar – Canoagem e Grupo de Teatro – Trupe Leal Conselheiro. O encontro, presidido pela Sr.ª Secretária de Estado da Ciência, Tecnologia e Ensino Superior, Maria Fernanda Rollo, contou com a presença de representantes de várias entidades, nomeadamente, Agência Nacional ERASMUS+, Cátedra da UNESCO da Universidade de Coimbra, Comissão Nacional da UNESCO, Agência Portuguesa do Ambiente, Ciência Viva, IES Ribeira do Louro, Porriño, Universidade Vigo. 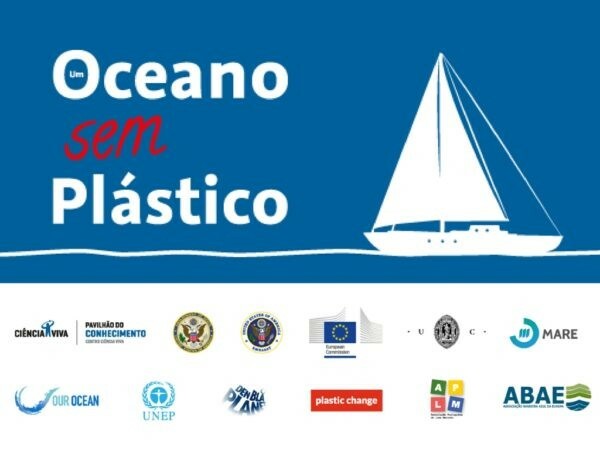 Foram apresentadas duas comunicações seguidas de debate com o público: Microplásticos nos Oceanos: desafios e soluções pela investigadora da UC / MARE Filipa Bessa e Resposta bioquímica de espécies aquáticas às alterações climáticas pela investigadora da UC / MARE Ana Marta Gonçalves. Os momentos performativos Artistic performances by students from partner schools foram apresentados pela Escola Secundária D.Duarte de Coimbra, Instituto Técnico Artístico e Professional de Coimbra, Escola Básica 2,3 de Ermesinde, Escola Secundária Dr. João Carlos Celestino Gomes de Ílhavo, Escola Secundária Alves Martins de Viseu e o Instituto Espanhol Giner de los Rios de Lisboa. 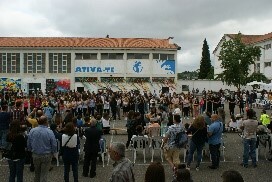 O evento terminou com um “Happening” na Praça 8 de Maio em Coimbra. Happening the National Day of the Sea in Portugal. Foi um dia intenso de partilha, em que quisemos colocar o foco no facto de os oceanos estarem a ser severamente afetados pela poluição e pelas mudanças climáticas, em que cada gesto e cada um de nós conta, e muito, para a preservação do bem comum, neste grande condomínio que é a Terra e a vida no Mar. Deixamos um especial agradecimento, pelo apoio da Orquestra Clássica do Centro e Fila K Cineclube, a todos os oradores pelos seus inestimáveis contributos, e por último a todos os alunos e professores que se envolveram de forma tão empenhada. 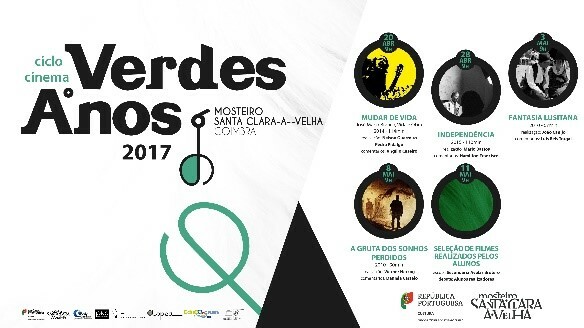 Alunos das turmas do 1º e 2º ano dos Cursos Profissionais de Animador Sociocultural e de Técnicos de Recursos Florestais e Ambientais visitam o CISE – Centro de Interpretação da Serra da Estrela em Seia e participam nas atividades Pré-CineEco. 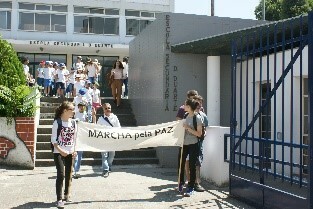 On June 2, the EduC02cean project made a commitment to the March for Peace, in a joined organization of PES-UNESCO-EcoMuseu. 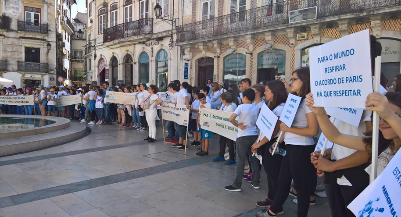 The students paraded through the city of Coimbra holding posters with phrases of alert and defense of a sustainable environment. 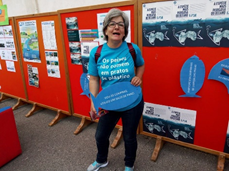 Also on June 2, the Mondego EcoMuseu organized and presented an exhibition of the EduC02cean project at the AECO closing party. 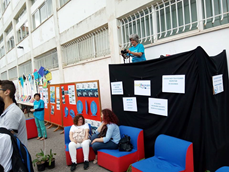 It was a civic experience for students, teachers and education members involved in raising awareness towards climate change issues, as well as promoting environmental sensitivity. It has also contributed to the promotion of healthy lifestyles, increased ability to intervene in citizenship issues, in particular the ODS. 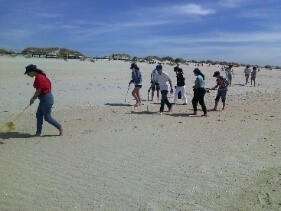 These activities had an impact on the school community and the surrounding environment. 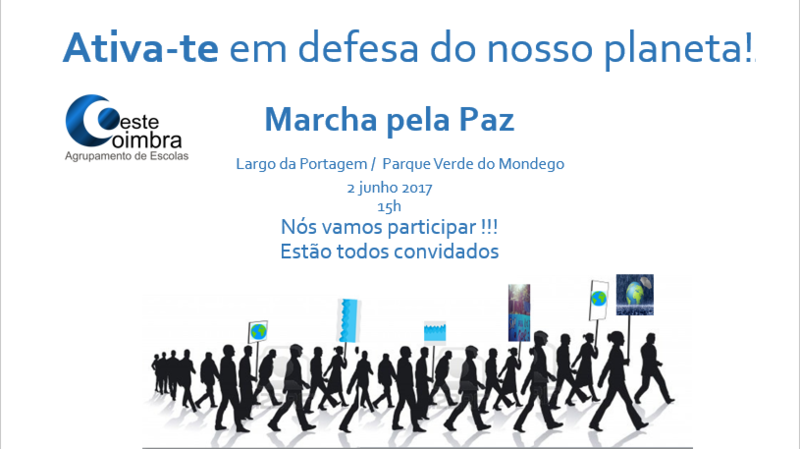 No dia 2 de junho, o projeto EduC02cean integrou com empenho a Marcha pela Paz, numa organização conjunta do PES-UNESCO-EcoMuseu, os alunos fizeram desfilar pela cidade de Coimbra cartazes com frases de alerta e defesa de um ambiente sustentável. 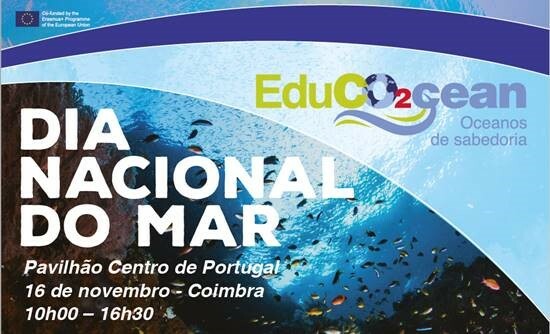 Ainda no dia 2 de junho, o EcoMuseu do Mondego organizou e apresentou uma exposição do projeto EduC02cean na festa de encerramento do AECO. Foi uma experiência cívica para alunos, professores e Encarregados de Educação envolvidos ao nível do alerta para os problemas das alterações climáticas, bem como na promoção da sensibilidade ambiental, contribuiu ainda para a promoção de estilos de vida saudáveis, o aumento da capacidade de intervir sobre as questões de cidadania, nomeadamente dos ODS. Estas atividades tiveram impacto na comunidade escolar e no meio envolvente. 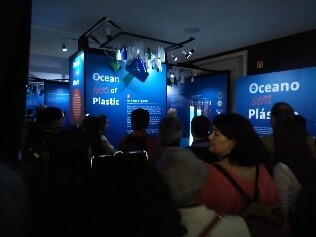 On May 24th, three students from the Sociocultural Entertainer Professional Course and a teacher participated representing the AECO at the inauguration of the exhibition An Ocean without Plastic in the Knowledge Pavilion with the following program: Opening Session; Sprintalk · Microplastics in marine environments; Visit to the exhibition; Dialogue with citizens · How to make the ocean cleaner and sustainable? 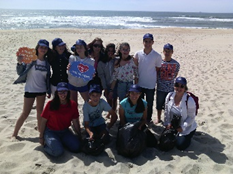 European policies and national priorities; Anti-plastic picnic and collection of microplastics in Praia da Mata, Costa da Caparica. No dia 24 de maio, três alunas do Curso Profissional de Animador Sociocultural e uma professora participaram em representação do AECO na inauguração da exposição Um Oceano sem Plástico no Pavilhão do Conhecimento, com o seguinte programa: Sessão de Abertura; Sprintalk · Microplásticos em ambientes marinhos; Visita à exposição; Diálogo com os cidadãos · Como tornar o oceano mais limpo e sustentável? Políticas europeias e prioridades nacionais; Piquenique anti-plástico e recolha de microplásticos na Praia da Mata, Costa da Caparica. 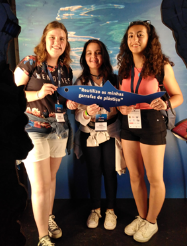 On May 20, the students of the F group of the 8th year participated in the 2017 European Maritime Day Meeting in Aveiro, promoted by ASPEA and integrated in our Ecos do Clima project. 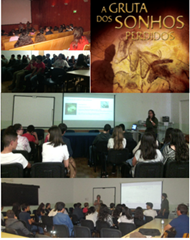 They were accompanied by the teachers Antónia Marina, Lourdes Pires and Teresa Lopes. 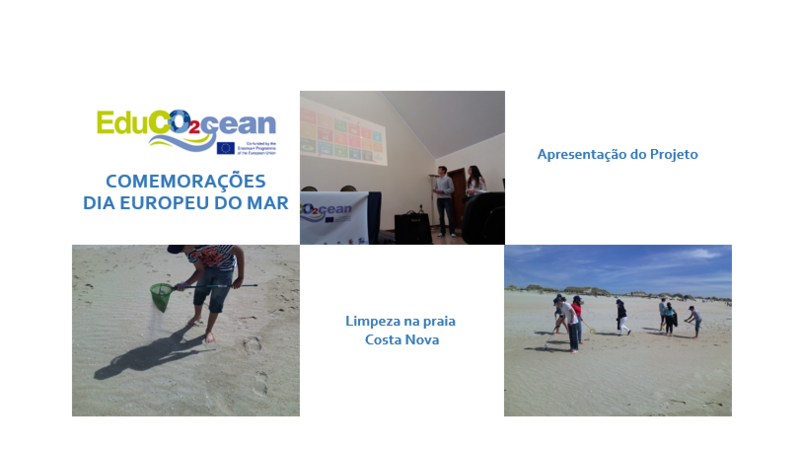 During the morning they attended the lectures of the different lecturers and two students presented a communication with the activities developed at school with the EduCO2cean project including its interconnection to the transversal projects of the Association of Schools Coimbra Oeste. 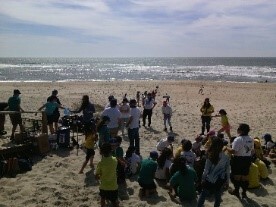 After lunch came “everyone on the wave” to promote a beach cleaning in Costa Nova. 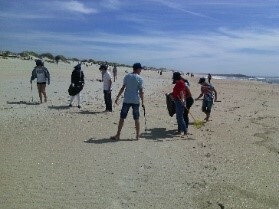 It was surprising how much garbage was collected in such a short time-everyone was incredulous. 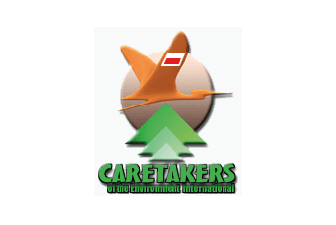 This enriching experience for students and teachers involved in the knowledge and communication of climate change, as well as the promotion of environmental sensitivity, has also contributed to the promotion of healthy lifestyles, increased capacity to intervene on issues of citizenship, namely the ODS – Sustainable Development Objectives. 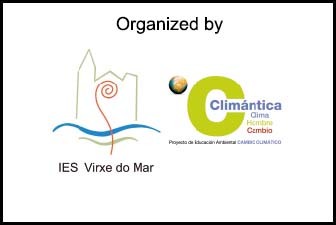 No dia 20 de maio, os alunos da turma F do 8ºano, participaram no Encontro do Dia Europeu do Mar 2017, em Aveiro, promovido pela ASPEA e integrado no nosso projeto Ecos do Clima. Foram acompanhados pelas professoras: Antónia Marina, Lourdes Pires e Teresa Lopes. Durante a manhã assistiram a palestras dos diferentes conferencistas e dois alunos apresentaram uma comunicação com as atividades desenvolvidas na escola do projeto EduCO2cean incluindo a sua interligação aos projetos transversais do Agrupamento de Escolas Coimbra Oeste. Depois do almoço entraram “todos na onda” de promover uma limpeza na praia da Costa Nova. Foi surpreendente a quantidade de lixo recolhido em tão pouco tempo – todos ficaram incrédulos. 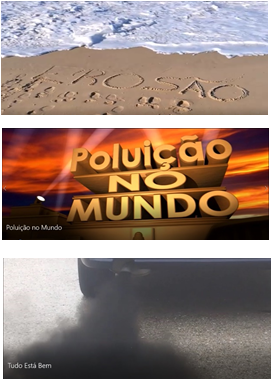 Esta experiência enriquecedora para alunos e professores envolvidos ao nível do conhecimento e da comunicação das alterações climáticas, bem como na promoção da sensibilidade ambiental, contribuiu ainda para a promoção de estilos de vida saudáveis, o aumento da capacidade de intervir sobre as questões de cidadania, nomeadamente dos ODS – Objetivos de Desenvolvimento Sustentável. A training session on The Cave of Lost Dreams – preservation and climate change was held on May 8, 2017, led by the marine biologist, Dr. Daniela Castelo, of ASPEA, for two groups of the 3rd Cycle, following the participation in the session of the film series GREEN YEARS – film The cave of lost dreams, by Werner Herzog. This work had the collaboration and participation of teachers Manuela Neves, Carolina Sousa, Nelson Agante and Teresa Lopes. The activity was carried out successfully, students and teachers emphasizing the recognition of the great interconnection to the contents addressed in the disciplines of the various areas of the curriculum. Foi realizada uma sessão de formação sobre A Gruta dos sonhos Perdidos – preservação e alterações climáticas, no dia 8 de maio de 2017, dinamizada pela bióloga marinha, Dr.ª Daniela Castelo, da ASPEA, para duas turmas do 3ºCiclo, na sequência da participação na sessão do Ciclo de cinema VERDES ANOS – filme A gruta dos sonhos perdidos, de Werner Herzog. Este trabalho contou com a colaboração e participação dos professores Manuela Neves, Carolina Sousa, Nelson Agante e Teresa Lopes. A atividade foi realizada com sucesso, salientando-se por parte de alunos e docentes o reconhecimento da grande interligação aos conteúdos abordados nas disciplinas das várias áreas do currículo. 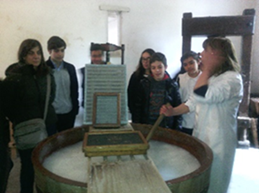 On March 27, 2017, a guided tour of the Paper Mill was held in Leiria, integrated in the “More than 100” Study Visit for all classes of the 8th grade. 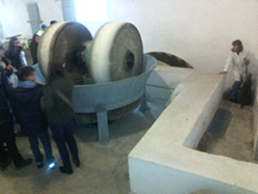 The study visit was as planned, having fulfilled the goals established. Participants expressed appreciation for the sites visited and assessed overall activity in the highest parameters. No dia 27 de março de 2017 foi realizada visita guiada ao Moinho do Papel, em Leiria, integrada na Visita de Estudo “Mais de 100″ para todas as turmas do 8ºano de escolaridade. A visita de estudo decorreu conforme o planificado tendo cumprido os objetivos propostos. Os participantes manifestaram agrado pelos locais visitados tendo avaliado globalmente a atividade nos parâmetros mais elevados. 3rd cycle and 2nd year secondary classes of the professional courses student (six classes) participation in training sessions on our ecological footprint, invigorated by Dr. Paulo Andrade of Quercus, following an energy audit conducted at the D Duarte Secondary School. Participação de alunos de turmas do 3ºciclo e do 2ºano dos cursos profissionais (seis turmas) em sessões de formação sobre a nossa pegada ecológica, dinamizadas pelo Dr. Paulo Andrade da Quercus, no seguimento de auditoria energética realizada na Escola Secundária de Dom Duarte. Practical sessions on “Diet and Climate Change” on October 17, 2016, sponsored by Dr. Sara Carvalho of ASPEA, for the 1st, 2nd and 3rd year classes of the Sociocultural Entertainer Professional Courses and of the Forest and Environmental Resource Technicians Professional Courses. 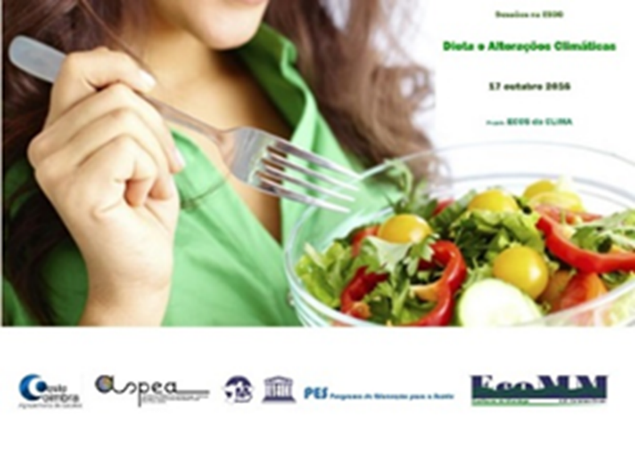 Sessões práticas sobre “Dieta e Alterações Climáticas” no dia 17 de Outubro, dinamizadas pela Drª Sara Carvalho da ASPEA, para as turmas dos Cursos Profissionais do 1º, 2º e 3º ano dos Cursos Profissionais de Animador Sociocultural e Recursos Florestais e Ambientais.